Steven J. Milloy was a columnist for Fox News and a paid advocate for Phillip Morris, ExxonMobil and other corporations. His main claim to fame, however, was as the junk-science arbiter at the head of The Advancement of Sound Science Coalition (later Center) (TASSC). This pseudo-association was established for the tobacco industry by APCO, which at that time was virtually Philip Morris's private public relations company. Milloy ran TASSC's website Junkscience.com, which was dedicated to debunking what he alleged to be false claims regarding passive smoking, global warming, DDT, environmental radicalism and scare science among other topics. His other website, CSR Watch.com, was focused on attacking the corporate social responsibility movement. He also heads the Free Enterprise Action Fund, a mutual fund he runs as a partnership with tobacco science executive Thomas J. Borelli, who was listed as the secretary of the Advancement of Sound Science Center. Milloy also operated the Regulatory Impact Analysis Project Milloy had offices in Washington, but later shifted his organisations to operate from his home in Potomac, Maryland. Milloy claims to hold a B.A. in Natural Sciences from the Johns Hopkins University, a Master of Health Sciences in Biostatistics from the Johns Hopkins University School of Hygiene and Public Health, a Juris Doctorate from the University of Baltimore, and a Master of Laws from the Georgetown University Law Center. He was registered as a lobbyist with EOP Group, then worked for a time with Thorne Auchter and James Tozzi through the Federal Focus operation. Then he was taken up by APCO to provide the behind-the-scenes functions of TASSC. In January 2006, Paul D. Thacker, a journalist who specializes in science, medicine and environmental topics, reported in The New Republic that Milloy has received thousands of dollars in payments from the Phillip Morris company since the early nineties, and that astroturfs controlled by Milloy have received large payments from ExxonMobil . A spokesperson for Fox News stated, "Fox News was unaware of Milloy's connection with Philip Morris. Any affiliation he had should have been disclosed." From the 1990s until the end of 2005, Milloy was an adjunct scholar at the libertarian think tank the Cato Institute. Milloy has spent much of his life as a lobbyist for major corporations and trade organizations which have poisioning or polluting problems. He originally ran the National Environmental Policy Institute (NEPI) which was founded by Republican Rep Don Ritter using oil and gas industry funding. Ritter also tried to get tobacco industry funding, but NEPI was dedicated to challenging the cost of Superfund toxic cleanups ordered by the EPA and the FDA, and transforming both of these government authorities to make them less effective. NEPI was also associated with the Air Quality Standards Coalition (AQSC) which was devoted to weakening Clean Air laws. This organization took up the cry of "we need sound science" from the chemical industry as a way to counter claims of pollution -- and Milloy became involved in (to the point of heading) the "sound-science" movement. Its most effective ploy was to label scientific findings that were detrimental to the large funding corporations as "junk." Milloy was one of its most effective lobbyists because he wrote well, and used humor -- and because, until recently, it was impossible to document his connection to the control and funding by the tobacco companies. Milloy joined Philip Morris's specialist-science/PR company APCO & Associates in 1992, working behind the scenes on the corporate threat newsletter "Issues Watch". By this time, APCO had been sold to another company, Grey Marketing, and the newsletter then became a part of the world-wide Grey Marketing organization. Milloy was then able to use this network as a feed source for propaganda services to a wider range of corporations who had international poisoning and polluting problems. Issues Watch bulletins were only given out to paying customers, so Milloy and APCO established the "Junkscience.com" web site, which gave him an outlet to attack health and environmental activists, and scientists who published findings not supportive of his client's businesses. Like most good PR it mixes some good general criticism of science and science-reporting, with outright distortions, lies, and manipulative pieces. The Junkscience web site was supposedly run by a pseudo-grassroots organization called The Advancement of Sound Science Coalition (TASSC) which had been organized by APCO for Philip Morris, APCO initially paid ex-Governor Garrey Carruthers of New Mexico to head this pseudo-front. Milloy originally was the back-room researcher and functionary brought in from the EOP Grpup who issued the press releases. However when Carruthers resigned, Milloy moved up and began to call himself "Director" and his friend and associate Bonner Cohen (who also worked for APCO) became "President". Milloy apparently still runs the Advancement of Sound Science Center and the Free Enterprise Action Institute. Those two groups—apparently run out of Milloy’s home—received $90,000 from ExxonMobil. Key quote: The date of Kyoto’s implementation will "live in scientific and economic infamy." Connections to ExxonMobil-funded groups: at least five. Steven Milloy, author of JunkScience.com, also criticized the Centers for Disease Control and Prevention for claiming that 400,000 people die every year from alleged smoking-related illnesses, saying that studies linking smoking to heart disease are not entirely reliable. He pointed out that smokers have higher heart disease rates than non-smokers partly because smokers also tend to be people who do not exercise, have worse diets, avoid doctors and have less healthy lifestyles overall. (CNS News 8/1). An activity report created for R.J. Reynolds by the lobbying firm Powell Tate indicates Steve Milloy was involved in RJR's Project Breakthrough, an multi-year effort to link tobacco prevention to alcohol prohibition in the public mind. Milloy's junk science web site appears to have been part of, or used in this project. An item under the heading "Project Breakthrough" in the report states, "Reviewed and revised junk science Website including calls with Steve Milloy, researching and compiling Website visitor comments, and reviewing and editing new materials for inclusion on Website." Milloy provided medical and political information service to British American Tobacco. For a number of years Milloy acted as an information source for British-American Tobacco. His relationship with Sharon Boyse, Director of BAT's Scientific Communications division (actually a PR division) began in the mid-1990s when he was running TASSC for Philip Morris, and seeking wider funding support from the tobacco industry. Later it was formalized through the regular provision of abstracts and news about scientific research into smoking and health, and other addictive behaviors. This was further extended into the political sphere with his regular fax distribution of the "Issues Watch" newsletter. which went out to most of the major tobacco companies by fax or e-mail. Steve Milloy, "Series 1: Q and A With Steve Milloy", Cato Institute, accessed October 2004. Steven Milloy, "Katrina Kicks Up Storm of Global Warming Debate", Fox News, September 01, 2005. Steven Milloy, "California tries to gag 'climate skeptics'", National Post(Canada), August 02, 2006. 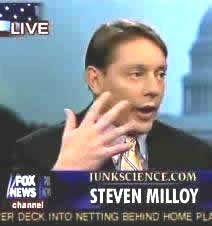 Steven Milloy, "Environmentalists Prompt Nuclear Power Wake-Up Call," Fox News, August 14, 2008. Steven J. Milloy, letter to Sharon Boyse, September 22, 1997 (tobacco industry archives, Bates #190204008). In this letter, Milloy requests $50,000 in funding for TASSC from the Brown & Williamson tobacco company. Steven J. Milloy, fax transmittal to Seth Moskowitz, September 10, 1998 (tobacco industry archives, Bates #190204008). Milloy alerts the R.J. Reynolds tobacco company about a new study linking maternal smoking to sudden infant death syndrome and adds, "Let me know if you need more info." Notes of Meeting CA Legal Support, March 21, 2000 (tobacco industry archives, Bates #2078856239). This Philip Morris memorandum describes Milloy as a "consultant" who "tracks scientific studies. Reviews mainstream journals and obtains info from e-mail subscriber lists. Filters for tobacco/food/beer relevance and sends sends responsive material to DC." Bonner Cohen, et al., ed., "The Fear Profiteers: Do 'Socially Responsible' Businesses Sow Health Scares to Reap Monetary Rewards? ", February 2002. Put a Tiger In Your Think Tank, Mother Jones, May/June 2005. Paul Thacker, "The junkman climbs to the top," Environmental Science and Technology Online, May 11, 2005. Josh Kalven, "Special Report hosted author of debunked radiation study to discuss Yucca Mountain", Media Matters for America, August 12, 2005. Chuck Jaffe, "When Making Money Takes Back Seat to Advocacy," Chicago Tribune, January 26, 2006. Daniel Gross, "Thank You for Investing," Slate, May 4, 2006. ↑ ExxonSecrets Factsheet: National Environmental Policy Institute, , Factsheet, accessed January 19, 2012.